State Records New South Wales, Sydney, Australia. 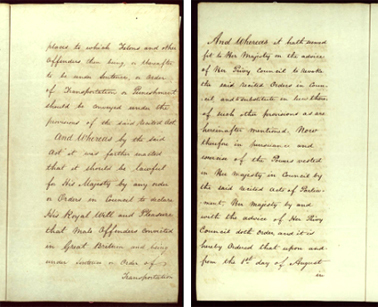 Order-in-Council ending transportation to New South Wales, 22 May 1840. Paper. Bound on the left side by a dark green silk ribbon threaded through the pages. Dimensions: 200 x 315 mm. In the 1780s, many of England’s poor were confined to overflowing gaols under a policy known as the ‘Bloody Code’, which created some 250 capital statutes that were punishable by death or ‘transportation to lands beyond the seas’. These problems were compounded by massive unemployment due to the ‘Industrial Revolution’. Food and materials once supplied from farms across the British Isles were now replaced by imports that were processed in mills and factories. British farm owners turned their land over to sheep grazing. They evicted farm labourers and their families, who, with no jobs and nowhere to live, flocked to the cities looking for work in the mills. Many resorted to petty crime to feed their families and indeed petty crime became a way of life for many. Criminality was widespread because it was hard to catch criminals in the warren like streets of the industrial cities and there was not a dedicated professional Police Force. Despite this the few gaols there were started to fill up and a solution to the crime problem was sought. In 1784, during Britain’s search for alternative sites to its North American colonies for the transportation of convicts, the British Parliament passed an Act empowering the Government to prescribe, by Order-in-Council, any place it considered appropriate for a penal colony. After much discussion, an Order-in-Council was made on 6 December 1786, appointing ‘the eastern coast of New South Wales or some or other of the islands adjacent’ as a place for transportation. Convicts were sent there from 1788. Despite it being a huge and very expensive experiment to set up a colony in an unknown land on the other side of the world, Britain decided to establish a penal colony at Botany Bay under the leadership of Captain Arthur Phillip. This was hoped to replace convict dumping ground lost in North America, clear out the British gaols, provide a deterrent to crime in Britain and establish a deep water port in the South Pacific for Britain to expand its territories. The First Fleet of 11 ships, each one no larger than a Manly ferry, left Portsmouth in 1787 with more than 1480 men, women and children on board. Although most were British, there were also Jewish, African, American and French convicts who were living in Britain and committed crimes. After a voyage of three months the First Fleet arrived at Botany Bay on 24 January 1788. Here the Aboriginal people, who had lived in isolation for 40,000 years, met the British in an uneasy stand off at what is now known as Frenchman’s Beach at La Perouse. On 26 January two French frigates of the Lapérouse expedition sailed into Botany Bay as the British were relocating to Sydney Cove in Port Jackson. The isolation of the Aboriginal people in Australia had finished. European Australia was established in a simple ceremony at Sydney Cove on 26 January 1788. Convicts were considered government property with few rights and humanity. Author Robert Hughes provides an insight to the psychology of the convicts themselves, citing that most convicts considered the term ‘convict’ to be offensive and referred to themselves as “government men”. The convict system can be viewed as a crude form of conscription where the lottery was not with the ballot but with the courts that decided upon transportation or gaol1. As the Colony expanded, new land was needed for farms and the new cash crop of wool, with sheep runs getting bigger and bigger. Several ex-army and ex-convict businessmen were becoming wealthy by exporting wool to England. They also had become quite powerful and even deposed a Governor named Bligh who tried to control their business activities. To the west of Sydney, the Blue Mountains presented a physical barrier and the challenge was set to find a passage. In 1813, explorers Blaxland, Lawson and Wentworth crossed the Blue Mountains and found rich grass plains as far as the eye could see. This was an economic bonanza for the New South Wales businessmen. The Government tried to regulate land use by setting up 13 counties radiating out from Sydney for 200 miles in all directions. Land use beyond these was forbidden. This was hard to enforce and businessmen sent shepherds into the frontier to ‘squat’ and graze sheep. Eventually the businessmen claimed this land as their own and became known as ‘squatters’. All the while Aboriginal people were being forced off their homeland and in many cases murdered if they resisted. Around this time Matthew Flinders was exploring the coastline of New South Wales and New Holland. In 1802-03, Finders circumnavigated the continent and was the first person to use the term Australia when referring to the whole continent of New Holland, New South Wales and Van Diemens Land. To curb the dominance of the squatters and to end the system of free convict labour, the Colonial Government decided to promote the migration of free settlers and limit squatter land leases to 14 years. 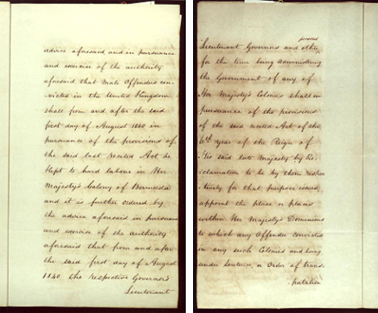 This was to create an emancipist (free people) consumer economy and improve the moral tone of the colony. The Colonial Government assisted some migrants by paying their fare to Australia and helped to set up farms and businesses alongside the wealthy squatters – who of course were not very happy with such competition. About one third of migrants who came to Australia between 1830 and 1850 paid their own way. Convicts and settlers who came to Australia found that in comparison to Europe, conditions were very good and with hard work and determination they could prosper. They encouraged their relatives in England to come to Australia and enjoy the prosperity. Women migrants were also assisted to curb a gender imbalance in the colonies, to work as domestic servants and to foster marriages and childbirth. These migration schemes resulted in 58,000 people coming to Australia between 1815 and 1840. 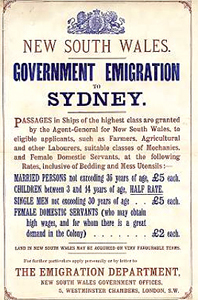 With increasing numbers of free migrants and the desire of Colonial society to be free of the hated ‘convict stain’, the Colonial Government decided to cease transportation to NSW in 1852. Between 1788 and 1868 approximately 160,000 convicts were sent to Australia. The policy of transportation was the subject of much inquiry and debate over the decades. In 1837, a British parliamentary committee headed by Sir William Molesworth recommended ending transportation to New South Wales. 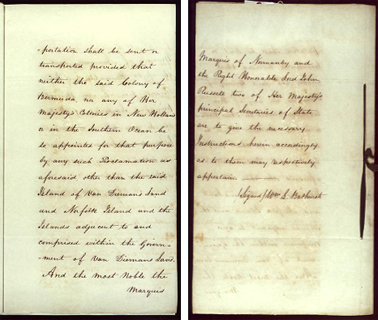 On 22 May 1840 this Order-in-Council was issued, removing New South Wales from the list of places to which convicts could be sent. (Van Diemen’s Land continued to receive convicts, and transportation to Western Australia began in 1850. 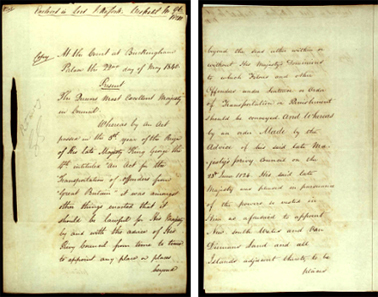 In 1848, there was an attempt to re-introduce a limited form of transportation to New South Wales, but local opposition was so intense the plan was abandoned and this Order-in-Council was not revoked. 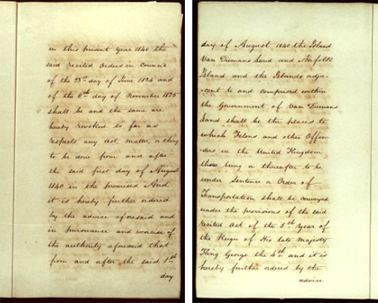 Secretary of State, Earl Grey wrote to Governor Fitzroy on 18 November 1849 advising him that no more convicts would be sent to the Colony. The Order-in-Council has historical significance as evidence of the 1840 Order-in-Council and its aftermath represented the turning point when, 50 years after its foundation, New South Wales ceased to be a penal colony. It was now defined as a free Colony in which the institutions of a free and, ultimately, democratic society could evolve. The Order-in-Council has aesthetic significance in the design and function of penal documents from the early colonial era. The Order-in-Council is significant for researchers as its the actual order from the Privy Council enacting the cessation of transportation to NSW. The Order-in-Council has intangible significance being an iconic object and a symbol of one of Australia’s brutal convict origins and early settlement and its transition to a free society. The Order-in-Council is well provenanced to the British Government. It is currently in the collection of State Records of NSW. The Order-in-Council is extremely rare as it the actual order from the Privy Council enacting the cessation of transportation. The Order-in-Council is in excellent condition for its age and material. 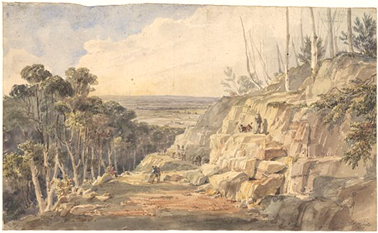 The Order-in-Council interprets the dependence of convict labour in the establishment, survival and expansion of the early colony at New South Wales. It also interprets the brutal convict origins of European Australia and the Government system and the cessation of convict transportation in response to concerns that it was not a deterrent and not a fair punishment for minor crime.